Love the sea? Think about having a nautical-themed wedding. Before you shake your head “no,” consider this: nautical weddings can be preppy, affluent and fresh. You can plan an ocean-inspired wedding without succumbing to the typical boat decor and sailor-style attire. Here are 10 ways to have an outside-the-box nautical wedding. 1. Find some way to incorporate a boat into your photos. Call a boathouse and ask if they’d let you use the setting as a backdrop for a few photos. You can have your photographer meet you there before you head to the ceremony to take some unique shots. 2. Navy and white isn’t the only color scheme you’re stuck with for a nautical wedding. Add a third color, like hot pink, bright coral or pastel yellow. You don’t have to opt for navy at all if you don’t want to, either. Any shade of blue will convey your theme. 3. Add a teeny anchor pendant to your garter to stick with your nautical theme without sacrificing your chic wedding gown. 4. Your shoes are one of the best accessories to have fun with. If your wedding gown is long, they won’t show unless you want them to. 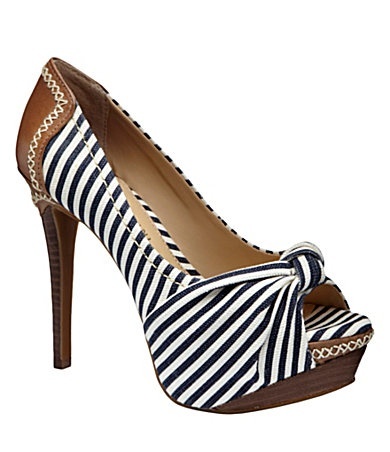 Blue and white striped shoes with gold accents are ideal for a nautical wedding. If you already have your heart set on a pair of white satin heels, have some fun with your trade-off shoes – the pair you’re going to slip on when it’s time for dancing. 5. 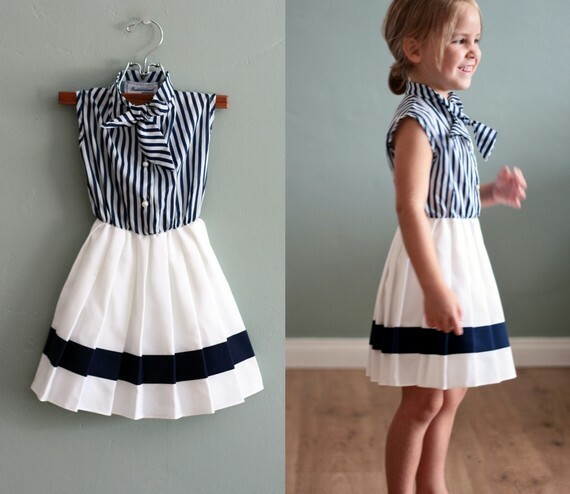 Just because you don’t want your bridesmaids in sailor girl dresses, that doesn’t mean that nautical outfits won’t be adorable on the ring bearer and flower girl. 6. Whether you’re creating some of the wedding decor yourself or you’re hiring someone to handle these details for you, cord and rope are your two best friends when it comes to nautical wedding decorations. You can use twist cord, rope or even baker’s twine to adorn picture frames, wrap around candleholders, accent flower vases and tie up napkins. 7. 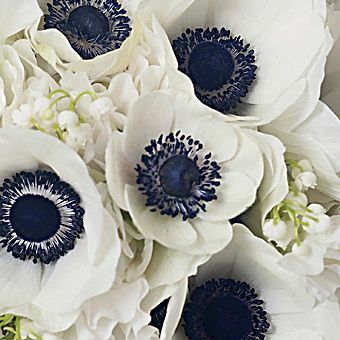 White flowers are the best option for a nautical wedding. Play with color when it comes to your vases or additional centerpiece items. If you don’t want completely stark florals, add a few colorful blooms here and there. 8. If you live near the ocean, spend a morning collecting driftwood to use as centerpieces. You can also purchase interesting pieces of driftwood if you don’t have access to it. 9. Have your bartender create a signature drink for the night, even if it’s just a subtle spin on a standard martini. The ingredients, color or even just the name should be nautical-themed. 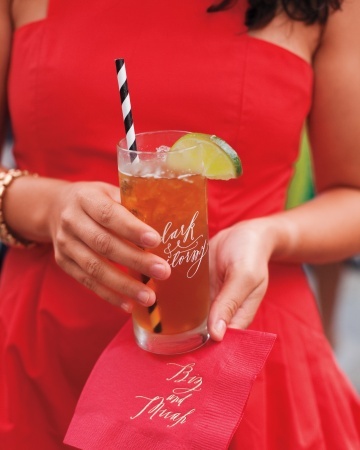 You can also have the drinks served in custom glasses that will double as guest favors. Photo courtesy of Martha Stewart Weddings. 10. The best part about a nautical wedding is that the menu can be chock full of seafood. Soft-shell crab, lobster bisque, steamed clams and grilled sea bass are all excellent options for a seafaring reception. Just make sure there are some non-seafood options for your guests, too. Also, since some people can have a major allergic reaction to shellfish, ensure that everything’s clearly labeled and that your guests know what they’re eating.